I would like to thank the many constituents who have written to me over the past month regarding the Senate. Let me simply state, that your messages are loud and clear. The Senate as it stands today must change, or it must be abolished. The Senate today is seen by Canadians as politically illegitimate, as it is not representative of the electorate. This is why the Harper Government in February 2013 sought clarification from the Supreme Court as to whether (i) the democratic reforms it has proposed can be accomplished by Parliament alone, and (ii) the process which the Senate can or cannot be abolished. The court is expected to rule on the government`s questions either this summer or early fall. Canadians want change in the Senate and our Government will continue to push forward in our efforts to achieve fundamental reform. We’ve heard from many voices from across the political spectrum that such reform should not be pursued, and that the Senate should simply be abolished. While I sympathize with this sentiment, I believe that Canada`s premiers cannot be viewed as the only viable option of protecting regional interests at the national level. As we all witnessed during the last 1970s and early 1980s, the Western Premiers did oppose the Trudeau Liberals` National Energy Program (NEP). However, they could not stop it. This resulted in a siphoning of $50 to $100 billion out of Western Canada`s economy to help Liberals get elected in Ontario and Quebec. A democratically elected Senate, representative of Canada`s regions, may have been able to stop the NEP before it came into law, as it could stop a future Liberal or NDP NEP II. Rest assured a Conservative MPs will always oppose attacks on Western Canada’s economy. But governments do not last forever. It is the nature of democracy. 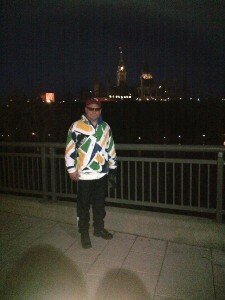 Hence, while I welcome the Premier of Saskatchewan’s recent public intervention on the Senate, I believe it is wise to wait until the Supreme Court’s ruling is presented to Canadians before proceeding, as it not yet clear how the government can proceed on the Senate. Until the court’s decision is rendered, the Senate has implemented tough new rules governing Senate residence and travel expenses to end the misuse of its residence and travel allowances – rules which were proposed by Conservative Senators. The Senate Committee on internal economy also unanimously voted to refer Independent Senator Mike Duffy’s expense claims to the RCMP. As well, the Senate recently passed a motion tabled by Senate Government Leader Marjorie LeBreton asking Auditor General Michael Ferguson to conduct a comprehensive audit of Senate expenses. Our government will continue to focus on delivering meaningful reform to the Senate, including elections, term limits and tough spending oversight. If the Senate cannot be changed, it must be abolished. I am in Amsterdam enjoying a room without 6 other men snoring. The swelling and blisters are settling down now. 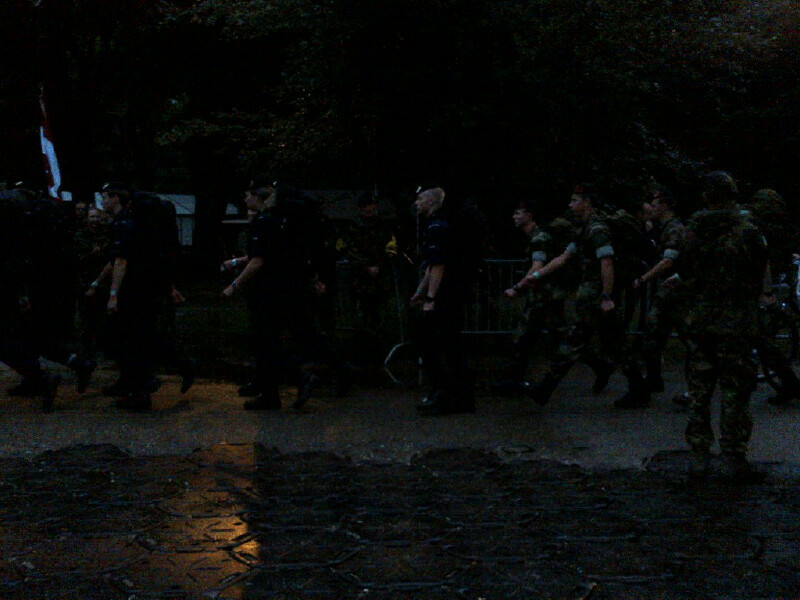 Nijmegen is probably one of the most challenging things I have ever done. The combination of the distances, pack weight and lack of sleep really pushed me pass existing limitations. I could not have done it without the team and military medics. They are awesome and really have the ability to get the most out of a person. 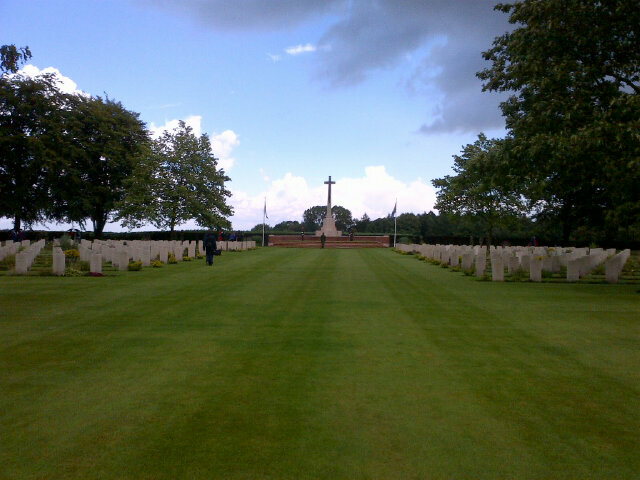 Throw in Vimy Ridge and Groesbeek Canadian War Cemetery – your emotions go from one extreme to another. 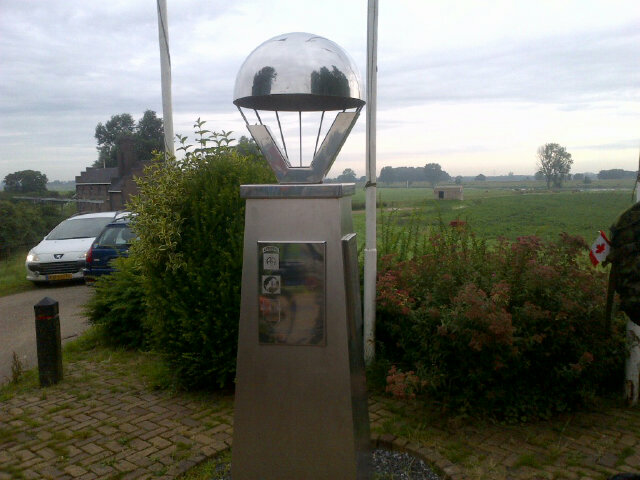 When I spoke at Groesbeek, I almost broke into tears. The respect the Dutch have for our military is shown in so many ways – huge cheering (bigger than any parade I have ever seen), young women hugging and kissing our guys, food, candy – to the amazing condition they maintain Groesbeek. They remember who liberated them. My leg muscle started to speak to me again this morning, but are still screaming when I walk. I am not doing a lot of sight-seeing now. I do want to see Anne Frank’s house and the Diamond Exchange, so taxi’s will be my mode of transportation today. Thanks for all the words of encouragement. The roaming data costs here are crazy, so I will post more pictures with comments when I get to a place with free wireless internet. Final day. 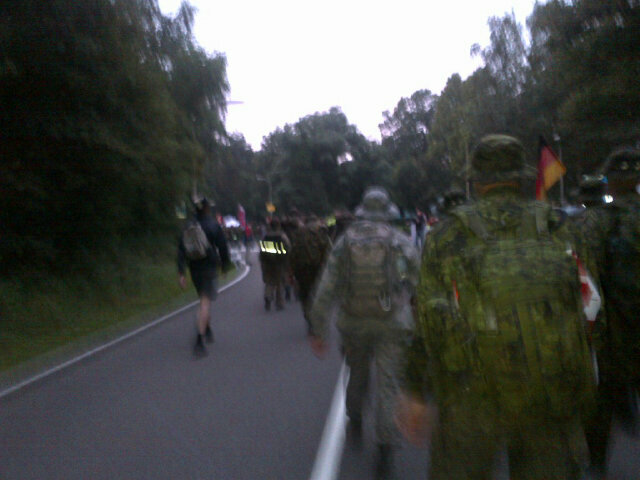 40 + km to go. I’m feeling really good or I have too much Tylenol in my system. The stars are out. No rain. Good morning for a march. Thanks to all the military folks, especially Mike Long, Jones, and Brigadier General Cotten for their hospitality. Congrats to all! 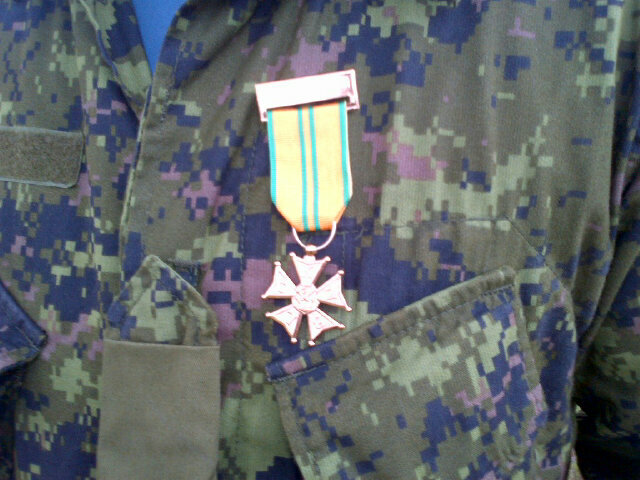 My medal for completing Nijmegen 2012. Day two. Here are some photos. Well it is July 17th and I am sitting in my bunk reflecting on a tiring but amazing day. To start off with, you should know our troops did spectacularly well. Each team had a variety of great marching tunes and it was fun to listen and watch them interact with the locals. The one group which really impressed me was the “The Soldiering on team” – a group which consists of soldiers who have a variety of illnesses and injuries. They have used the march as a goal to help overcome the challenges they face. Amazing individuals!! We had a 4 am wake up and went through the process of a quick bite, change, morning prayer and then getting in formation for our 6 am march start time. 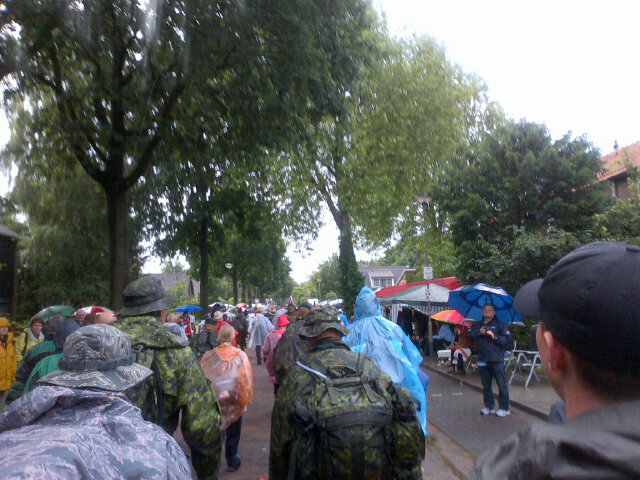 Our camp is located approx 5 km out of Nijmegen, so we marched to and through downtown Nijmegen in the drizzle/rain. There where supporters sitting on the sidelines on lawnchairs, couches (and standing) cheering us on. A lot of high fives and vocal encouragement were received, with a few of the soldiers getting hugs and flowers. 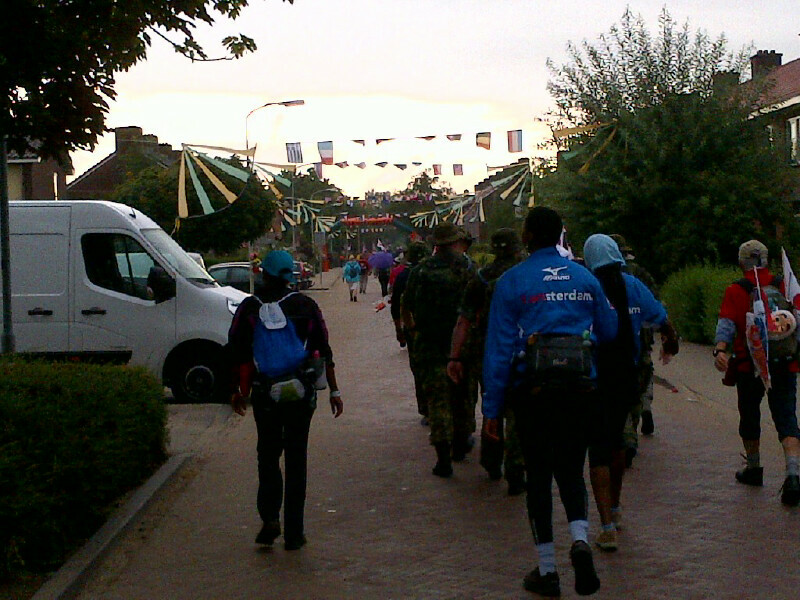 At Nijmegen, we were joined by individual marchers – 40000 people walking being cheered on by 1000000 spectators . There were bands playing, local media broadcasting and everyone was in a festive mood. 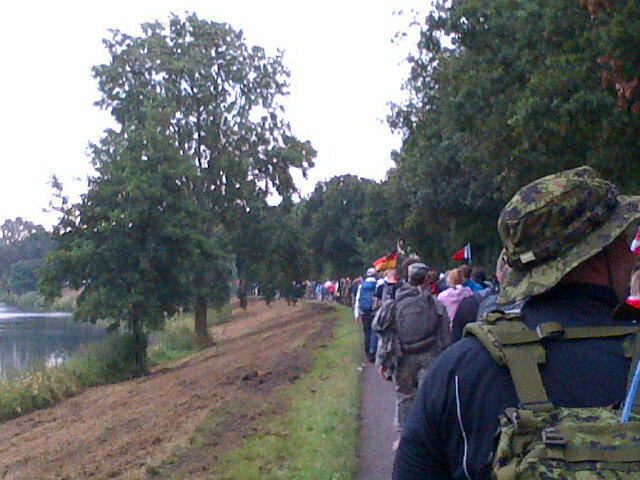 As we proceeded out of Nijmegen, the site was amazing…it looked like a long rope of people walking and talking. The locals offered us candies, drinks and fruit, and the kids high-fived us and sought out Canadians and others for pins and flags. By midday the sun appeared – the temperature was a perfect 19 degrees. We didn`t like to stop unless absolutely necessary. If you stopped, your muscles turned cold and stiffened up. So we tried to drink and eat on the fly. I must say I was very happy to see the finish line. At about 40kms, I felt what seemed like an electrical shock in my right little toe. 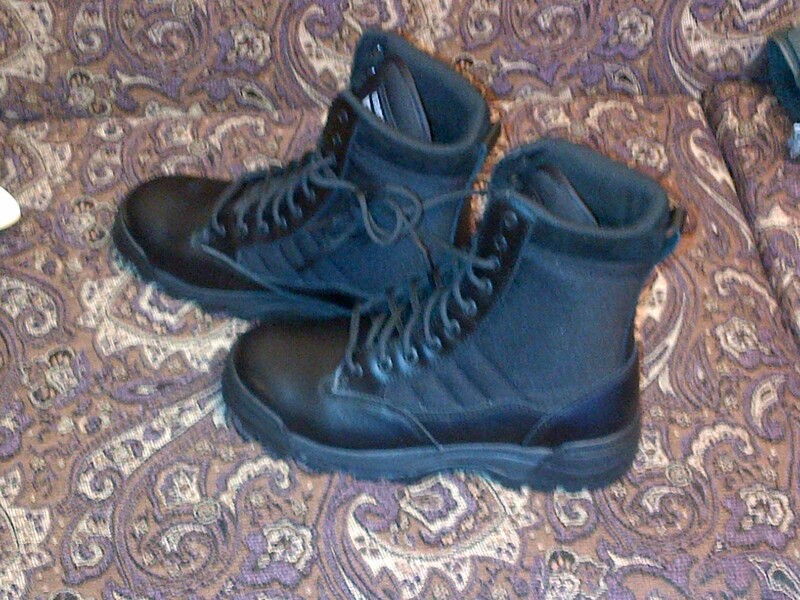 There was no way I was stopping, as it is problematic to remove a boot, as the possibility of swelling is great. So I sucked it up and walked through the pain. After about 5 minuntes, the electrical feeling dissipated, but I knew it was either a blister or tow nail coming off. Crossing the finish line was a joyous feeling. My team and I finished with a pace of about 5.3 km an hour. 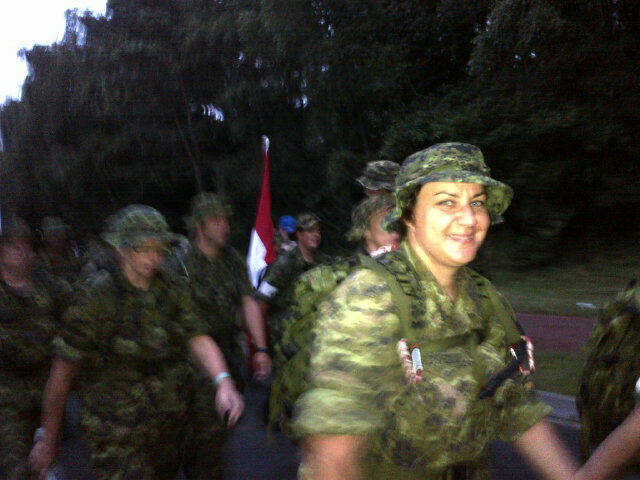 I must say that for the last 4 kms, there where many non-Canadian soldiers limping and struggling to get over the line. Everybody would encourage them and cheer them on! After the march, we headed back to the Swamp (MASH term for our bunks) and engaged in a beverage while soaking our feet in a pool of cold water….ahhhh. I then proceeded to go and see the medic and deal with my little toe. It turned out to be a huge blister that popped while walking. 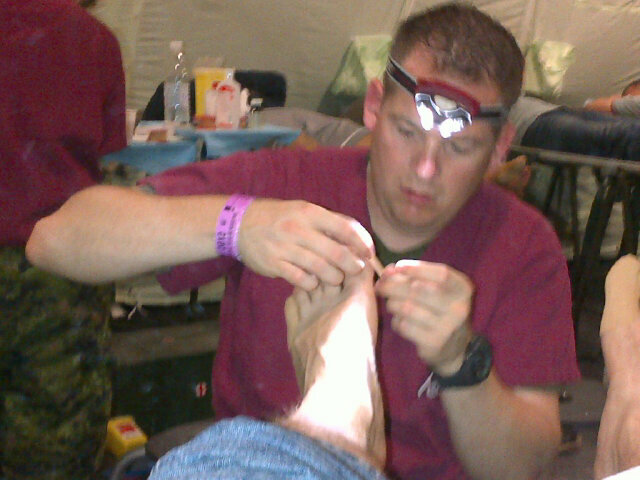 The medic proceeded to treat the nail and blisters and somehow relieve the pain. They have some new ways of taping that they have learned from the Dutch that is amazing. It took the close to 2 hour to re-tape and treat my feet. After laying in the medics bed it was tough to stand, but after walking around and some stretching I limbered up rather well, and amazingly, no pain in my feet. Most of the teams are now sleeping. Ear plugs are blessing, as a few of guys (and gals) snore very loud. We have completed Day 1, and tomorrow morning wake up is 3am. Well it is the night before the March. My feet are taped, my backpack is packed and weighed, my clothes are laid out, my boots are cleaned and polished, and I just showered. I’m a little nervous or excited – not sure which! 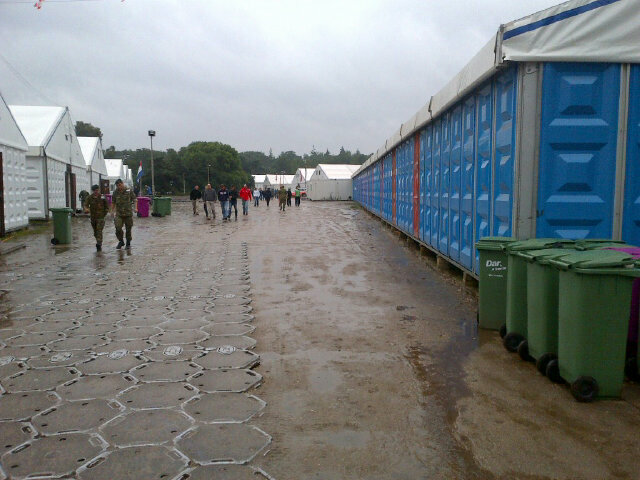 It has been raining off and on all day, and the grounds are muddy. There is a good crew of guys here. I bought them all lunch today as a thank you for including me. Local residents have begun pre-placing their lawn-chairs for Tuesday’s march. They are cabled and locked to the post. 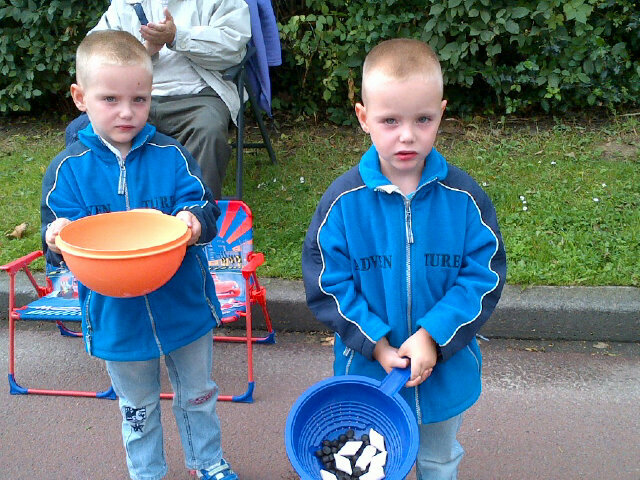 Bastille Day! Happy Birthday France! Busy morning. Up at 5am and had breakfast. I forgot how good French bread is. And the cheese….wow!!!! We are on the bus heading to Vimy. I’ve started reading up on the battles. It is numbing the number of lives that where lost. Troop moral here is good – I’ve already met quite a few of our troops. Their stories of the training, and the competitive nature instilled in their teams. They are very tight knit groups. You can tell they have spent many hours together. The forecast for today is rain so we are in are rain jackets, temp is warm. Must say the crops here look good. Landed safely in Lille, France. Big day tomorrow at Vimy. Great group of marchers! They all look fit and are excited to go!! Thanks to Richard Brown, John Gormley and Stephanie Levitz for great interviews on the importance of the Nijmegen marches. For those who are wondering, the couch is House of Commons issued. 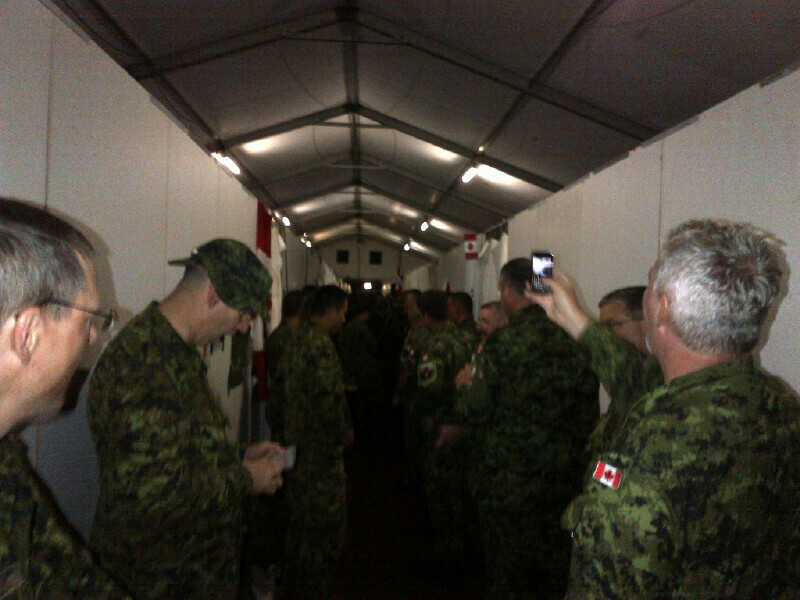 I will be twittering on my way to CFB Trenton (http://www.twitter.com/mprandyhoback) It’s’ now 1:50 PM… time to head out. 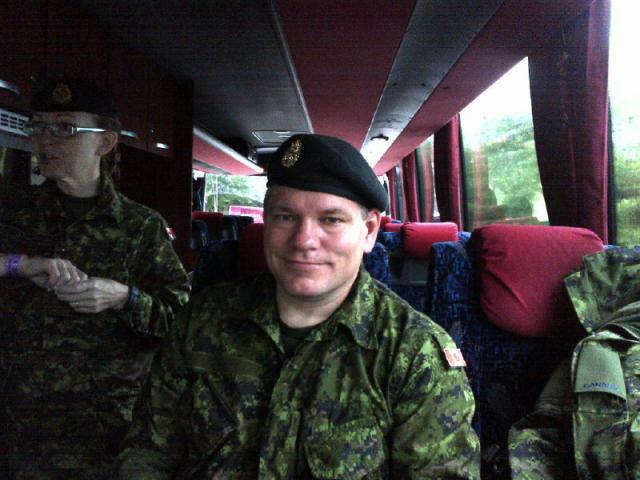 From July 13, 2012 to July 23, 2012, I will have the honour and the privilege of taking part in the Nijmegen Marches program – a rigorous and prestigious annual event in the Netherlands. The Marches have involved Canadian participation since 1952. 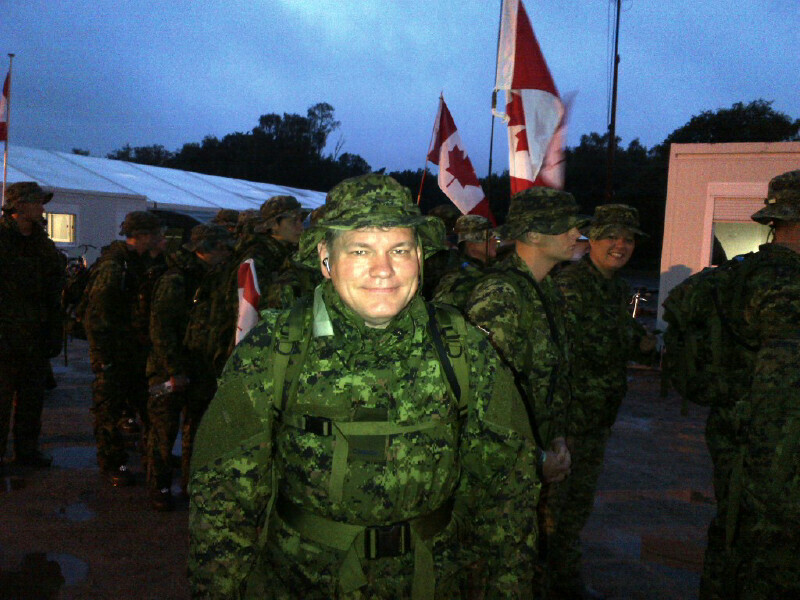 They require that entrants complete the four-day (June 17-20, 2012) 160-km (4 x 40-km) march in combat uniform, carrying a minimum rucksack load of 10-kg. The event annually draws over 40,000 marchers from 50 different nations — and is witnessed by over 1 million spectators along the 160-km route. 2012 marks the 96th time the Marches have been held since they began in 1909. 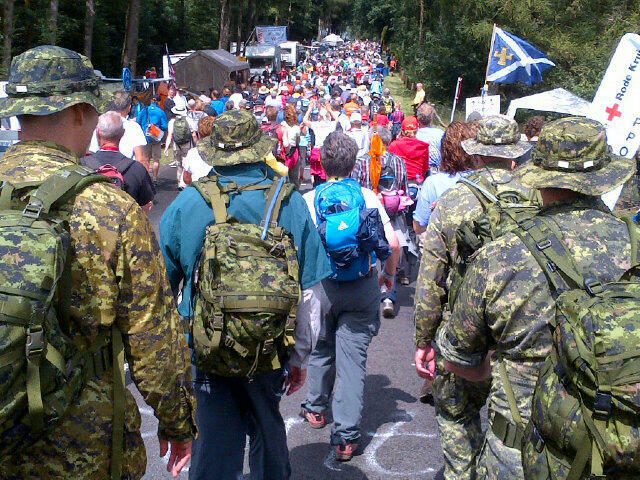 The Marches are both a challenging and an emotional experience, especially for Canadian Forces members. The Nijmegen March is the largest annual pilgrimage of Canadian soldiers, sailors and airmen to a war cemetery outside of Canada. During the Second World War, Canadian soldiers liberated the area around Nijmegen, and there is a large Canadian military cemetery in nearby Groesbeek. It serves as the final resting place for over 2,300 Canadian soldiers and airmen. The cemetery is on the route of the 3rd day of the March, and all military marchers halt there to pay their respects and conduct remembrance services. The Canadian ceremony is also among the largest and most elaborate. For most of the young Canadian marchers, it is the first time they have visited a Canadian War Cemetery, and they are often left surprised at just how emotional an experience it is. They also come away with a better understanding of their own history, and they see why the Dutch people hold the Canadian teams in such high regard. 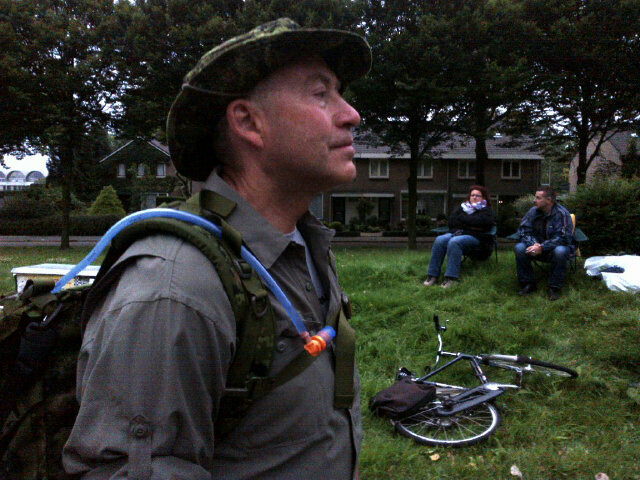 Throughout the Nijmegen program, I will post commentary and photos to my Nijmegen Marches Blog, which can be be accessed by clicking the menu selection at the top of my website (www.mprandyhoback.ca). I will also be posting updates via Facebook and Twitter. Everyone is also invited to follow my progress via the Runtastic widget located at the bottom right of my website. Clicking the link in the widget will bring users to my official Runtastic activity site – which displays both a map and statistics of my progress. I have also added a application which links my Facebook page to my Runtastic activity site.